Prepare the steak and set aside to cool. Slice the steak into strips of your desired thickness. To make the dressing, place all the ingredients in a food processor and process until smooth and creamy. Taste and adjust seasoning. 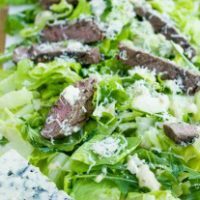 Assemble the salad by tossing 2 tablespoons of dressing with the greens, drizzle more dressing over the top and place the steak pieces then top with more blue cheese crumbles.